Parable from PupComp.com is here to chat about his new project. 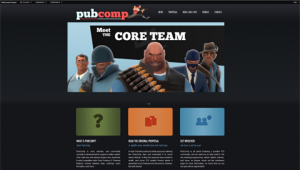 The Team Fortress 2 system that he hopes will bring pub gamers together with pro players. We catch up on his progress getting the project off the ground and the tools he’s using to organise and plan. With only a few weeks passed since the post on reddit a great deal has been acheived. The new user site is taking shape. It replaces the orginal html static site on the url http://www.pubcomp.com but the distintive borderless page won’t be live for another week. The big focus this week is to get eveyone on to TeamLabs. As useful as it is to have a Steam group for pubcomp, it’s a lousy way to organise people into their various roles. speaking of which, after just a few short weeks it looks like almost everyone needed for the project at this stage has been found. If you’d like to know more about PubComp or have a question you’d like Parable or Agro to answer drop us an e-mail on wip@thepodkast.com or leave us a message in the show comments below. posted on your steam profile.